A Fresh Veggie Burger Twist: Got Beets? The first year we grew beets on our farm, it was on a serendipitous whim because neither me nor my husband had ever cooked with beets. As serendipitous gardening fate would have it, we pulled out a bumper beet crop that fall — quickly necessitating research in what to do with them. 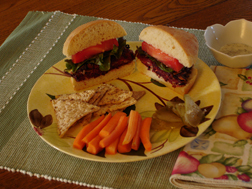 Which led us to developing this Beet Burger recipe, a new twist on the veggie burger. It’s a very adaptable, forgiving recipe—feel free to modify and experiment with ingredients, like substituting carrots for some of the beets. The burgers freeze well (freeze them on a tray before placing in a freezer bag so they don’t stick together) and taste surprisingly good cold. The recipe is a bit complex, so I usually make a triple batch in a jumbo bowl and stock up for a while. 1. Mix all ingredients well in a large bowl. Easiest to mix with clean hands. Yield: approximately 12 burger patties. Are the beets raw & peeled or cooked and peeled? If cooked, how do you cook them – baked or boiled? Thanks – looks like a recipe I’ll try. Thanks for your comment. The beets are raw. Easiest to use a food processor for all the grating in this recipe. I start with grating the cheese, then do onions and, lastly, beets. Thank you so much for the recipe… the best veggie burger I have ever had was made from beets but I have never seen a recipe… Thanks! I use a very similar recipe and add a good amount of cooked and mashed white beans to the mix. It improves the texture and adds protein.